Cupcakes 'n Daisies: Merrily I Shopped Along . 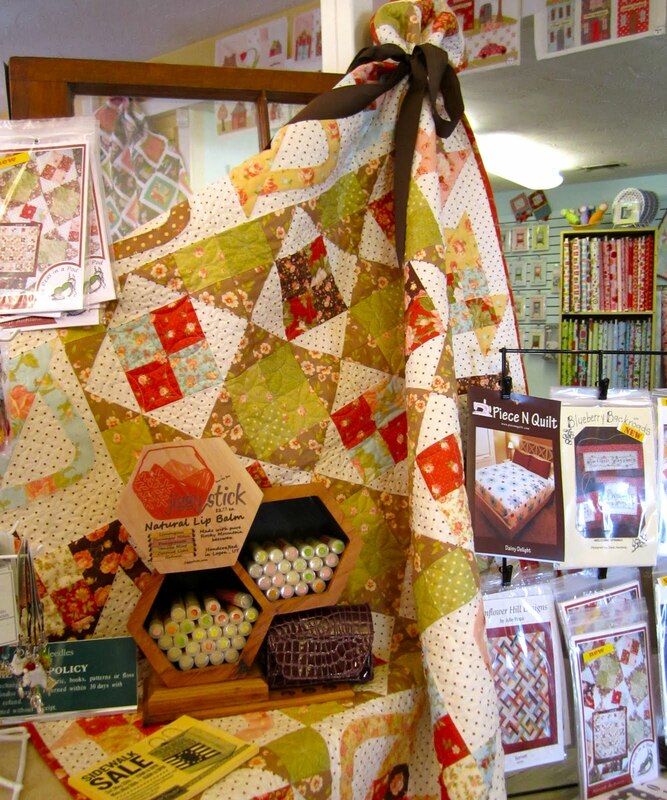 . .
After I wrapped up my two Carrie Nelson classes, sponsored by the Corn Wagon Quilt Company, I had a little time to visit some Salt Lake City quilt shops. So armed with a map, Garman, and list of 15 area quilt shops, I hit the road, my primary goal, to visit as many quilt shops as humanly possible in the course of 24 hours! But before I could start my shopping spree, I had one little errand to run, to drop off Carrie at the airport, Carrie was heading back home. So when Carrie asked if I could drop her off at the airport I was happy to do so. Since Carrie didn't mention which airport, the first thing I did was research airports in the Salt Lake City area. 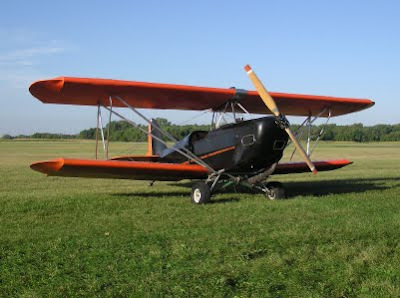 There were two, one boring airport with commercial jets coming and going all hours of the day and night, the airport where I picked up Carrie at the beginning of the week, and a municipal airport with rows of biplanes stored under carport type structures in a huge grassy field. Well that was an easy call, I figured Carrie would prefer to head home in one of these. I could just picture Carrie riding in the back with the wind blowing her hair, a scarf flying behind her back and Carrie talking to the pilot the whole trip. Well let this be a lesson to you, when someone asks for a ride to the airport, you don't get to pick the airport, THEY DO! Guess I missed that chapter in my Emily Post Etiquette book, luckily for me I was able to get Carrie to the airport of HER choice in plenty of time for her flight. That's my story and I'm sticking with it, click here for someone else's take on my choice of airports. 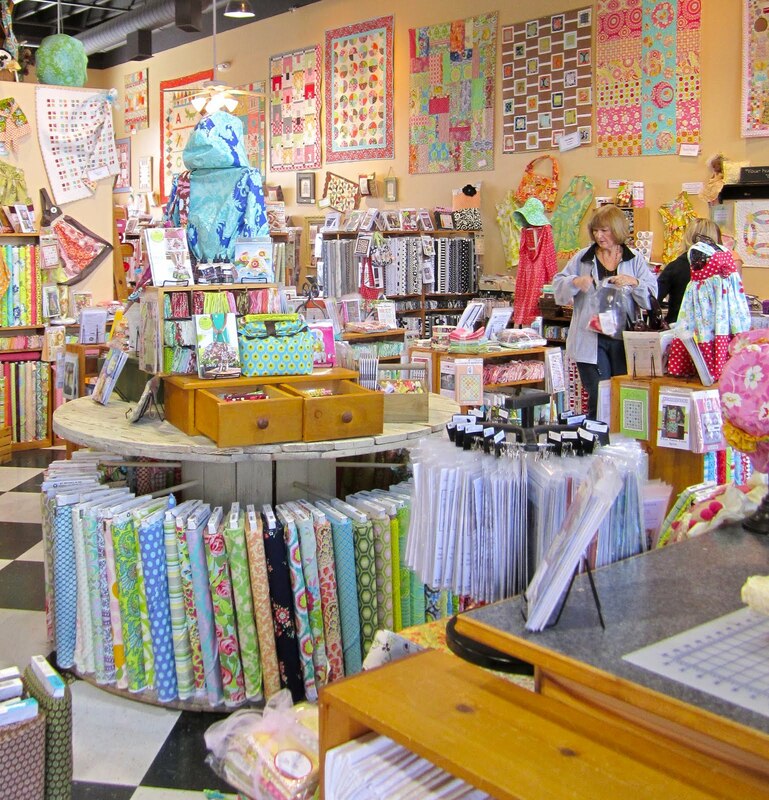 I don't know this to be a fact, but I would be surprised to find an area that had more quilt shops in a hundred mile radius than Salt Lake City. 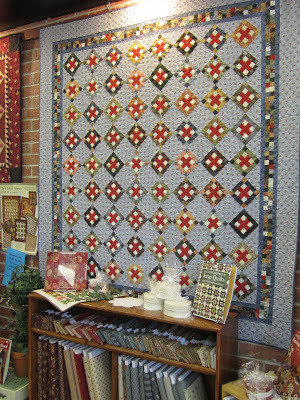 In the span of a mere 100 miles I found 15 quilts shops, 15 amazing quilt shops. I was able to visit ten of them. Do you realize that I've never visited more than 10 different quilt shops in an entire year, yet, in the course of 24 hours I looked, shopped, swooned, and walked through 10 quilt shops! I can drive 100 miles any direction from my house and am lucky to hit 2 shops. All the shops were friendly, encouraged me to take all the pictures I wanted, and even suggested bakeries, restaurants and ice cream parlors for little pick me ups. The raspberry stuffed iced sugar cookie was definitely worth the stop. So here are a few random pictures that pretty much summed up my amazing day. Is there anything better than a red and cream churn dash quilt? Quilter's Haven was a just that, a wonderful quilter's haven. I ran across new fabric companies, Riley Blake is huge out there, and new pattern designers. Look at this adorable display of Schnibbles patterns, all pinned to an ironing board. everything amazingly bright and cheerful. 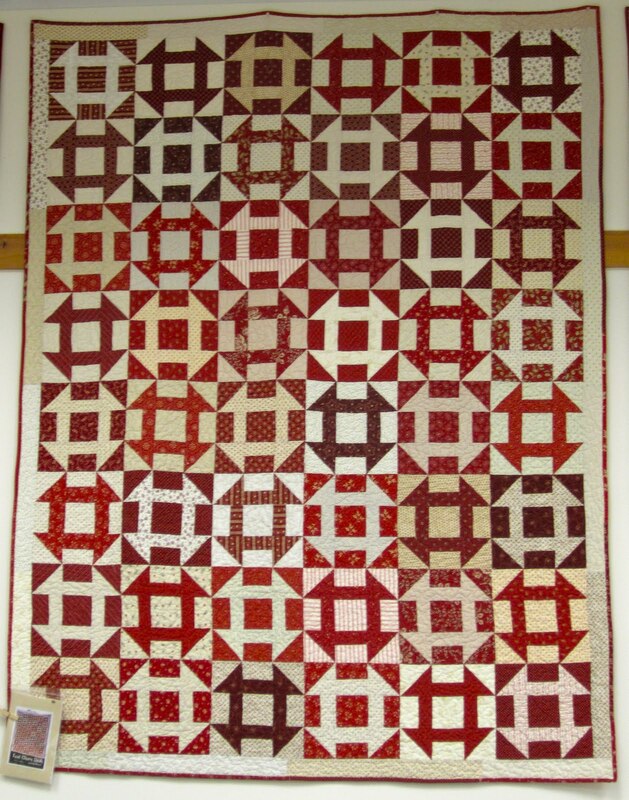 This pattern is called "The Red Cross Quilt" by Geoff's Mom Pattern Company. Naturally I like the colors of this quilt, but I was also drawn to those wonky stars. 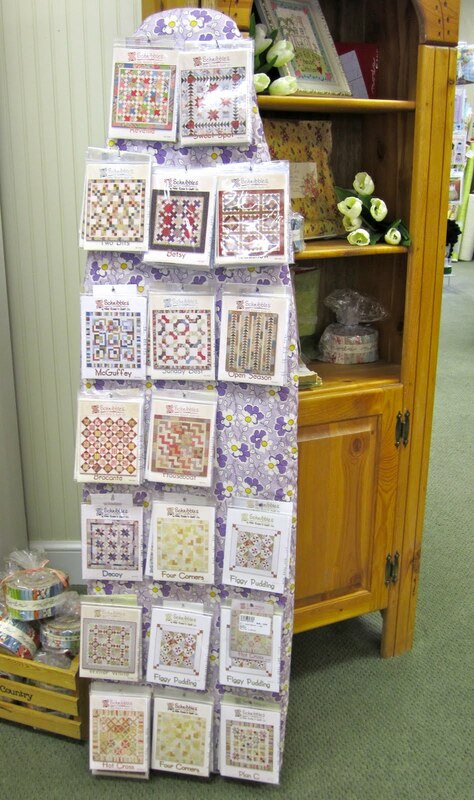 This quilt shop, Pine Needles, was in a very interesting area called Gardner Village. All sorts of specialty shops are now housed in buildings that were once part of a mill town. I had to cross a covered walking bridge to get to the quilt shop and passed a bakery, candy shop and housewares shop on the way. You could spend all day shopping at Gardner Village. I have no idea what that fabric is, but I love it, and the dog. It was easy to pick out Piper's Quilts shop from the street. And I arrived just as Lynette Anderson started putting on a trunk show. All her quilts were amazing. I have a whole new appreciation and love for applique projects. So that's the high points of my day of shopping, and it got me to thinking, if the Salt Lake City area can support that many quilt shops, there must be more quilters per capita in Salt Lake City than any other city in the world, or maybe just the US or maybe just Utah, but for sure, there must be many many quilters out there. One post left of my vacation, yes, I did make it to Market and the French General shop in LA! WOW! You had your own personal Shop Hop! Amazing! We are dwindling here with quilt shops. They are either closing or moving further away :-( My closet one is 35-40 minutes Interstate driving. And BTW it's where Carrie comes and teaches in the winter sometimes. I've got to catch her class if she swings south again. Thanks for the lovely tour of your shop hop. Thanks for the tour, it was awesome! My sister in law asked me to pick her up from the airport...she never said which one so I assumed it was the big one since the smaller one near us was fairly new.....guess who was wrong? I was, she was so upset and I don't blame her but she never specified and I just assumed....both of us were in the wrong. Another great installment of the Amazing Adventures of Thelma! Next time show us all the loot you bought at those ten quilt shops! I did the St George Utah area shop hop last year and had a blast. Oh my goodness! What a fun trip! I am a "Louise wannabe"!! Ah vacatiOn would be nice right now! We have about 7 shops in my city. Mid June we are off to a soccer tournament in another city! I am prescouting the quilt shops there!! i love that wiener dog!!! i don't want to MAKE the wiener dog (or even own him) but i love his picture! Sounds like a dream trip! Love the little doxie! Thanks for sharing! Loved the tour...can I come next time and I won't complain about the airport...promise LOL! My stomping grounds! I know and use all those shops. Next time you're in SLC I'll broaden your cupcake horizons. Whoa! I'm jealous!! 10 shops?? :D Must be nice living there! What a fabulous shopping experience! And what great shops -- and quilts! That should fuel your imagination (and your stash) for a while. WOW 15 quilt shops ! Oh how I would love to see each and everyone of them. Did you pick up anything new during your shopping spree ? Thanks for all of the wonderful pictures. Forgot to say, glad these quilt shops are doing well. One near me is closing and then another is for sale. There won't be any good ones nearby. You made it to the best Salt Lake area shops!!! How fun it must have been! Gardner Village is such a pretty place...they always decorate wonderfully for the holidays, too! Thanks for the tour. I would love to visit these shops! I found a great printable map at www.utahshophop.com. I printed one to take with me on my next trip to SLC. Looks like great fun shopping--thanks so much for sharing. Very much enjoyed seeing all the special little things you noticed! Wow, that sounds like such a fun trip! 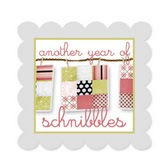 I knew that the mecca of all things scrapbooking was in Utah, but didn't know that the same is true for quilting! That would be such a great vacation -- only for me, not the rest of my family. Can you see their eyes rolling now? I loved your airplane story. We really are fortunate to have so many great shops close by here in Utah. Although it is also a great temptation too. I have to discipline myself sometimes. 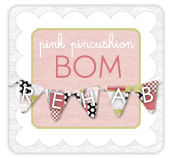 So many awesome projects and fabrics out there. 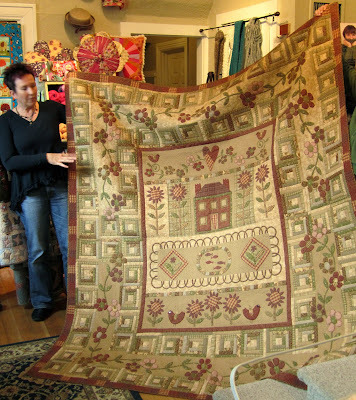 I love this world of quilting! Wow, you must have a lot of self control to walk in and out of shops so quickly! 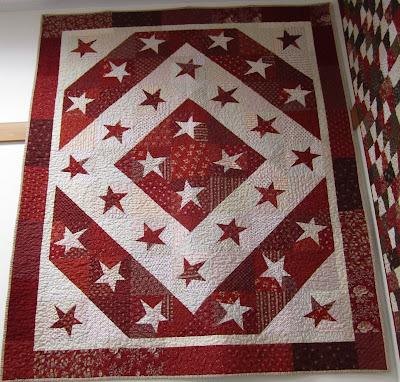 I've done shop hops with friends and it seems we never make it to as many shops as we'd like because of time...um, shopping :) Love that red/white quilt with the wonky stars too! Did you get the pattern name? Thanks for sharing! I love Utah for it's beauty...who knew there were so many quilt shops...I may just have to vacation there next year! Thelma, I just have to look at your blog and I get inspired to get stuff going in my own sewing room. Loved the red/white church dash as well! 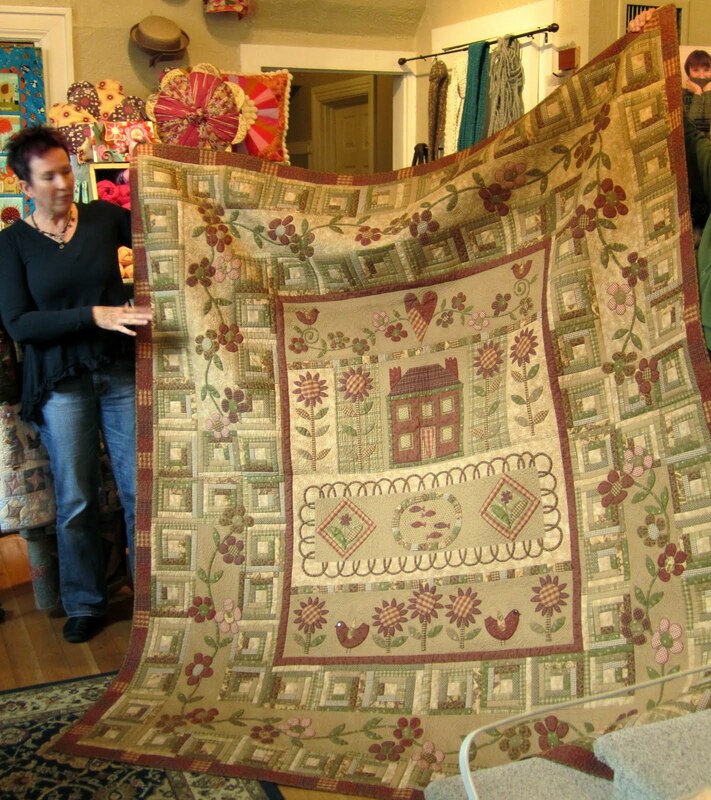 Lovin; those quilt's designs and colors. Happy sewing! I love all your quilt shop visits. The quilts hanging in front of Pipers Quilts are beautiful, but I don't understand how the quilts don't fade. Even if they bring them in daily!